And lo, on this night, teams of three gladiators in their finest togas shall endeavor to attain eternal glory. Great modern minds will design and build their chariots, race them up and down the streets, creating a party that honors the gods of Mount Olympus... In other words: Teams of three are tasked with creating a custom Chariot to race around a challenging course.. DESIGNED BY SMARTICUS, PULLED BY GLUTEUS AND MAXIMUS. And lo, on this night, teams of three gladiators in their finest togas shall endeavor to attain eternal glory. Great modern minds will design and build their chariots, race them up and down the streets, creating a party that honors the gods of Mount Olympus... 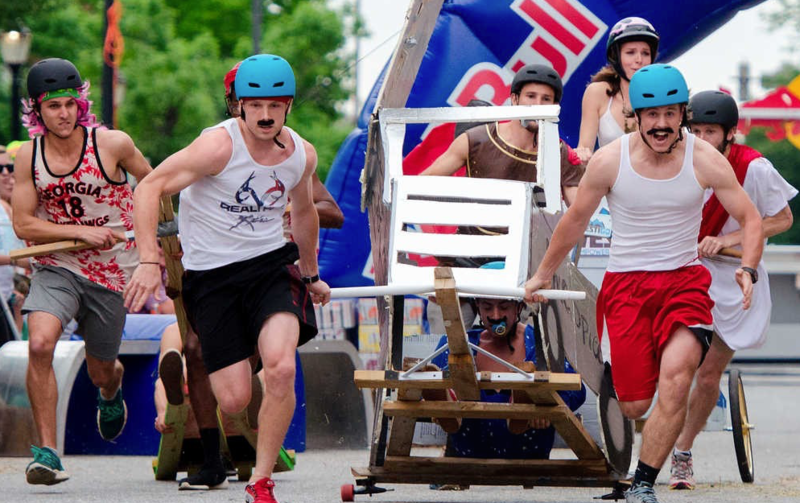 In other words: Teams of three are tasked with creating a custom Chariot to race around a challenging course. Each Chariot must have two wheels and a strut. We will not be providing any materials for the crafts. Make sure to bring some light to your chariots. The race will be taking place at night and you'll want to grab the attention of the crowd with some neon lights on your chariot. Reminder that there will be a people's choice award based on your creativity of your chariot alone. Teams will consist of three students and must have all 3 students riding or pulling the craft, however, one student must be designated as the “pilot”. No prefabricated chariots. Get creative! No sharp corners, edges or spikes anywhere on the chariot. No engines or external energy sources to power movement. This works flinstone style. No launching from your craft (intentionally) or launching any items from it. No fire or pyrotechnics (firecrackers, torches, etc). No smoke of any kind. Drivers must be at least 18 years old. Please bring a valid ID. Helmets must be worn by all 3 teammates during launch. Safety first! Craft has to make it through the course to be considered in the competition.